Back to the Future | Tennessee Aircraft Services, Inc.
General aviation is a pretty conflicted world. We fly around in 40 year old airplanes with new avionics and call it modern. We might even install a “new” engine that is mostly the same as the old one but with a relocated induction system or two turbos instead of one. We might install aftercoolers instead of an intercooler (pretty much the exact same thing) or roller cam followers (which cars have had for decades). So what’s so “new” about a Diesel engine? After all, it was first conceived by Rudolf Diesel in 1893. I must warn you, I’ve been waiting for someone to wrestle a viable Diesel engine into an airplane since I was a teenager. Back then, the latest aviation magazine would have another article about an obscure builder that had created some sort of Compression Ignition (CI) engine for possible aircraft use, and I’d get all excited and show it to my Dad. He would respond with something to the effect that Diesel aviation engines were the engine of the future and always would be. As an engineer he just couldn’t see a way to get the CI engine packaged in a way that would make it competitive with the gas engine. This discussion would repeat itself many times over the years. The last time was after Airventure 2012 when Cessna announced the SMA CI engine would be replacing the turbocharged gasoline spark ignition engine in the T182T for 2013. Disclaimer: There are many variations on the design theme and various fuels used which change the correct naming of any particular compression ignition engine. For the purpose of this discussion, I may use the term Diesel in a very generic sense. 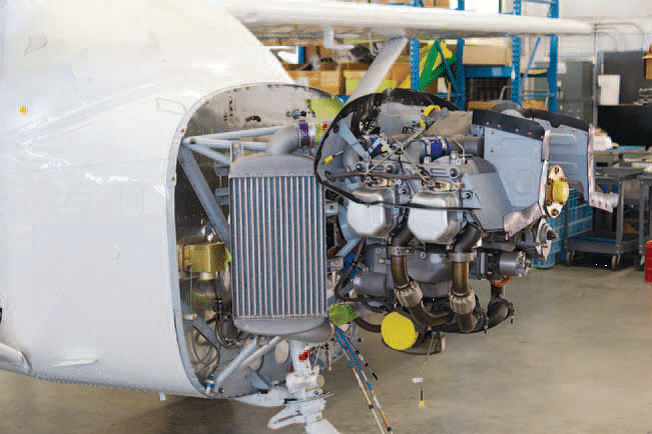 One significant difference with this time around is that the biggest general aviation company in the country has installed this CI engine on one of their mainstream production airframes. Cessna certainly isn’t a company to take blind risks, and this decision is no exception. The two companies have been in conversations for about ten years, each vetting the other’s capabilities and intentions. The basic technology isn’t new, but the successful application certainly is. Just like the current aircraft gas engine is just a totally tweaked version of what we flew fifty years ago, the SMA CI aircraft engine is a totally tweaked Diesel. The basic execution is similar to a very powerful and reliable turbo Diesel truck engine from many years ago. The real technology is getting something that should weigh a ton and needs liquid cooling to fit in a package to fit within small aircraft weight and complexity restrictions.. The gasoline spark ignition engine seems to easily make the transition to direct drive air cooled aircraft engine while the CI engine requires extreme measures for the same hurdle. It’s similar to Ginger Rogers dancing with Fred Astaire: Ms Rogers had to do everything Mr Astaire did only backwards and in heels. My Diesel engine experience is limited to the two cylinder 16 horsepower Diesel powered Ford tractor Dad purchased for the shop over thirty years ago. It’s such a simple and reliable engine that I rarely have need to work on it or learn much about it. The use of the SMA engine in the 182 offered me an excellent opportunity and motivation to get an education. 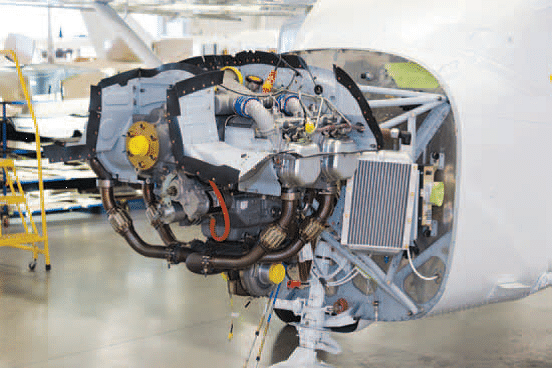 Cessna and SMA provided a class in June specifically for the J182T engine installation, and it seemed like a great opportunity to get the needed education. Way back in 1893, Rudolf Diesel discovered that highly compressed air would generate enough heat to ignite a fuel. The expansion of the burning fuel would push a piston down to provide the work desired. This is beautifully and simply demonstrated by the fire piston, a common survivalist tool for starting fires. The fire piston demonstrates how easy it is to ignite a fuel by the use of compressed air alone. Just drop a small piece of cotton (fuel) into an empty cylinder. Then a piston is placed at the top of the cylinder and plunged down with significant speed to highly compress the air/fuel mixture. The sudden compression and resulting heat will ignite the cotton in a flash, no spark required. The four cycle compression ignition engine follows some of the same steps as a spark ignition engine. The piston moves down in the cylinder with the intake valve open, which draws a large volume of air into the cylinder (induction or intake stroke). On a spark ignition engine, fuel is included with the air induction during this stroke. As the piston reaches the bottom and begins to move back up, the intake valve closes, which allows the now upward moving piston to compress the air (compression/ignition stroke). On a spark ignition engine, the spark plug(s) would fire about the time when the piston reaches the top of this stroke. On a compression ignition engine, there is no spark needed, but some fuel is. At about the top position of the piston, fuel is injected at very high pressure (16,000 p.s.i. on the SMA) just as the heat of compression (15:1 ratio) spontaneously ignites it. As the fuel rapidly burns, the resulting expansion of the gases push the piston down (power stroke), applying torque to the crankshaft. Finally, as the piston reaches the bottom of its travel, the exhaust valve opens. The piston then pushes back to the top of the cylinder, expelling the spent fuel/air mixture (exhaust stroke). As it turns out, this compression ignition event puts extreme stresses on the components such that usable engines needed to be constructed of very heavy materials like steel and cast iron. Definitely not airplane engine materials. SMA spent a great deal of effort finding and using various aluminum alloys that had sufficient strength but stayed within reasonable weights. Every solution has its problems, but the advantages of the CI engine make it an ideal candidate to try to overcome the few faults it has. The fuel burned in a CI engine is denser than gasoline, so it weighs about 11% more per volume but also delivers more energy. Net efficiency ratings are 20% + over similar power rated spark ignition engines. The result is that less fuel needs to be carried along, and what is taken yields more energy for the trip. The high compression ratio of these engines allows the fuel to expand further during combustion. This lowers the exhaust gas temperatures, which reduces wear on all the exhaust parts including the turbocharger. This more efficient burning of the fuel also translates into very little Carbon Dioxide emissions. The Carbon Monoxide emissions are almost eliminated. Being Jet fuel (a cousin of kerosene), there are no concerns about lead deposits or lead supplies. A new set of issues come with Jet fuel. Water is suspended in jet fuel, so it won’t typically sump out. Water will also freeze in the fuel causing restrictions to flow and other unspeakable problems. The water found in jet fuel also carries microorganisms and bacteria. These may show as a brown goo (highly technical term) in the gascolator. A fuel additive called Kathon may need to be used to fend off these living submersible pests. These are well known issues with commonly known solutions. I was able to look at a couple of production J182T engine installations while visiting the Independence, KS plant a couple of weeks ago. They are very clean and new as one would expect but very dense. The core four cylinder engine is very tidy, but the plumbing for the air induction, intercooler and oil cooler occupy almost every bit of open space under the cowling. The new cowling has two large air inlets in addition to the normal ones for cylinder cooling. These supply air for oil cooling, induction air cooling (intercooler) and induction air supply. Changes in the cockpit appear minimal. 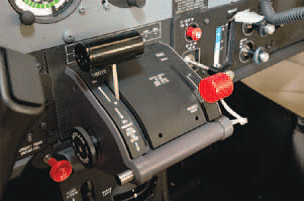 The obvious difference is the throttle quadrant replaces the push­pull controls used on the avgas powered models. The left lever is the power control and the red one on the right is for changing from normal electronic control of the engine to echanical backup mode. There is no mixture control and no prop control. The one back up instrument for the engine is a manifold pressure gauge. These are just a few off the top observations on the J182T. Next month, I’ll dive a little deeper into the SMA engine installation and the J182T flight operation. Please note my warning in the second paragraph of this article. I have no stock in Cessna or SMA, so don’t take any of this as some sort of advertising hype for either. During my visit to Cessna and training with SMA, there was no “wining and dining” although that would have been great for my ego. I got just about as excited when the first composite production airplanes hit the market but I didn’t have an outlet for my excitement at the time. The truth is that this is the first real change in production piston aircraft design in a long time and I’m just “geeked up” about it. So next month we’ll continue the conversation and you’ll have to put up with details on the SMA engine plus my hands on flight in the prototype J182T ­ Way Cool. 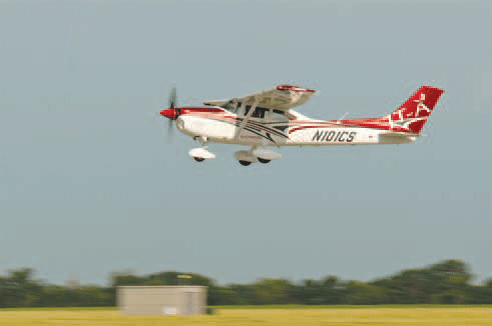 A special thank you to Cessna Aircraft Company for providing the pictures for this article.